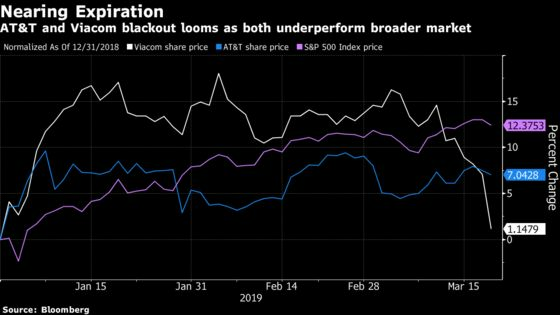 (Bloomberg) -- Viacom Inc.’s looming blackout on DirecTV, which is now owned by AT&T Inc., "feels like deja vu all over again" to BTIG LLC’s Richard Greenfield. The cable network owner fell as much as 5.5 percent to $26.01 per share, its lowest intraday level since early January, as AT&T is slated to drop Viacom channels when their programming contract expires Friday. But Greenfield remembers when "DirecTV dropped Viacom networks back in 2012 and it did not end well for DirecTV, with competitors seizing on the opportunity to capture market share at DirecTV’s expense." With the current subscriber struggles at DirecTV and DirecTV Now, BTIG doesn’t "see the logic in AT&T risking further deterioration" of its customer base by dropping the number one channel for kids between the ages of two and eleven across all broadcast and cable networks. "We wish them #goodluck explaining to subscribers paying industry-high monthly bills for video service why SpongeBob, Loud House, Paw Patrol, and Peppa Pig have all disappeared," Greenfield said. AT&T has risen 7 percent year to date, though it has underperformed the broader market’s double-digit gain.